With out a doubt, Ontario has some of fantastic hiking opportunities. No matter where you hike, you likely do it for the feeling you get. Sometimes that feeling is one of peace and relaxation, sometimes it is spiritual and sometimes it is a feeling of utter exhaustion and of course there might be the occasional time when you think to yourself “what was I thinking when I started this trail!? !” My personal love of hiking has been filled with all of those feels and often all of those feelings rolled into one. This past summer I had the opportunity to hike to the top of “Silver Peaks” in Killarney Provincial Park with a couple of close friends. To give you an idea of the type of hike Silver Peaks [caption id="attachment_760" align="alignright" caption="Explorers Steve Kostecki and Mike Rowe"] [/caption] offers, it was once one of the highest mountain peaks in all of Canada. Over time and because of Ice Ages, the landscape and mountain side has eroded. In the present day, you can see as far off as Sudbury in one direction and Manitoulin Island in the other direction. Not to mention the vast open waters of Georgian Bay. A hike up Silver Peaks is deceiving. Once you access the trail, (there are several access points,) you have a feeling of “What? Is this it? 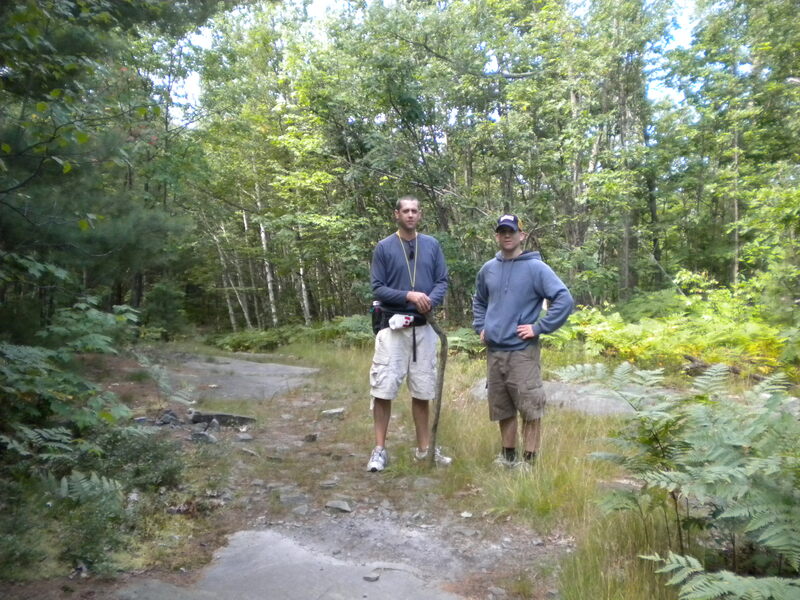 I thought I was hiking up a mountain.” The first half of the trail is a fairly easy hike. The path is wide and you are treated to wonderful views of small lakes, bogs and beautiful trees. The trail is well-marked with very few spots to get turned around at. If you start out fairly early in the morning you will also find the trail less busy which is important if you are looking for peace and quiet as well as possible animal sightings. (This is bear country so take appropriate precautions.) At roughly the half way point the trail up takes on a very dramatic change. You start heading uphill and at first it doesn’t seem too bad but then the trail changes and becomes littered with rocks and roots, it narrows in spots and there are sections where you are grasping for small trees and limbs to hang onto and use as leverage to pull yourself up. The rocks are loose and it is very easy to sprain an ankle. The hike up seems to take forever and I find that after about every 20 minutes of climbing that I am thinking that I must be insane for doing this. I didn’t know what to expect with this trip and while we had brought enough food, it would have been wise to bring more water (especially for hiking this trail on a hot summer’s day like we did.) I would suggest using a Camelback® to keep properly hydrated. Continuing the trek just gets more and more difficult. The loose rocks continue to be a hazard and wearing shoes or hiking boots with good traction is a must at this point. The trail again deceives as it seems to open up to the sky. You feel like you are getting close and the trees below you seem to have topped out their growth. However when you look around you notice that there are still more trees growing higher. It is hard to imagine that trees are able to grow on such rocky terrain but they manage quite well. It’s at this point that you are about ¾ of the way to the top. You will know when you are getting closer to the top when you start to notice small blueberry bushes popping up through the granite. If you are hiking at the right time of year (Early August,) these will be full of the most delicious blueberries you will ever try. 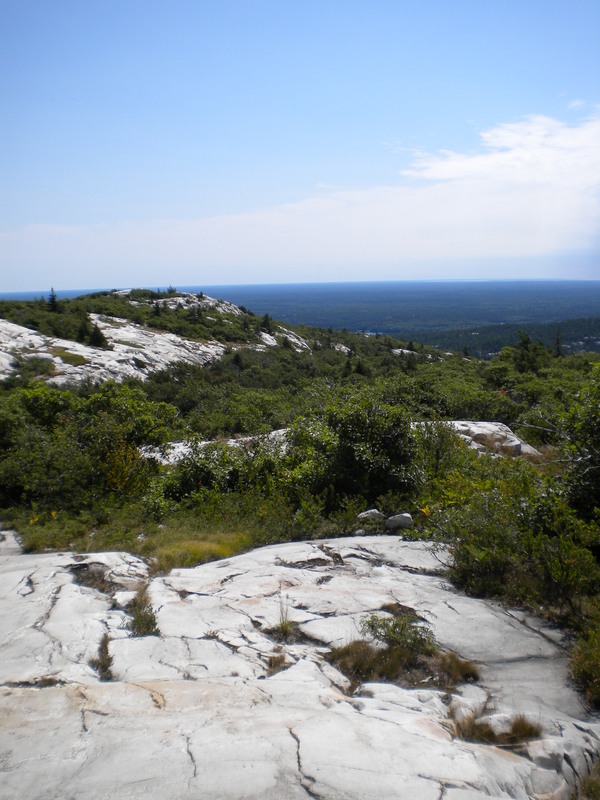 A few more painful feet and the trees disperse as the ground changes to a smooth white granite rock face. This section is still a little tricky because the granite provides no traction at all. (It would be very treacherous on a rainy day as you can see water stains on the rock face where water has frequently rushed down the hill.) However with one final burst of energy you reach what is roughly the summit. 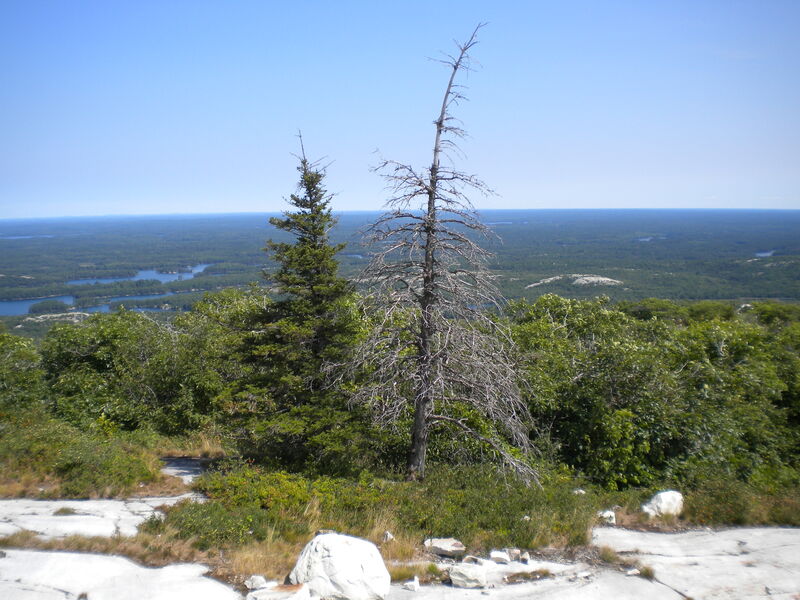 (Silver Peak is part of La Cloche Mountains so there are several different peaks.) Once at the top you are treated to stunning views in every direction. The landscape at the top is beautiful. There are blueberry bushes everywhere and these berries combined with the view make the hike one of the most rewarding experiences I have had. You literally feel like you have earned the experience. My friends and I take the time to sit and enjoy a lunch (and more blueberries for dessert.) It is just the 3 of us sitting at the top of one of the highest points in Ontario. After spending roughly an hour at the top relaxing we embark back down the trail. Going down is always faster than going up but it is important to be mindful of your footing on this trail. The rocks and roots are even more hazardous. This hike will be physically exhausting but the memories will well worth it and you might even find yourself thinking about doing this hike again in the months and years that pass. Although on the day you finish you might swear off hiking for a while. If you are looking for a place to rest your head after doing this hike, I would suggest Killarney Mountain Lodge located at the doorsteps of Killarney Provincial Park. 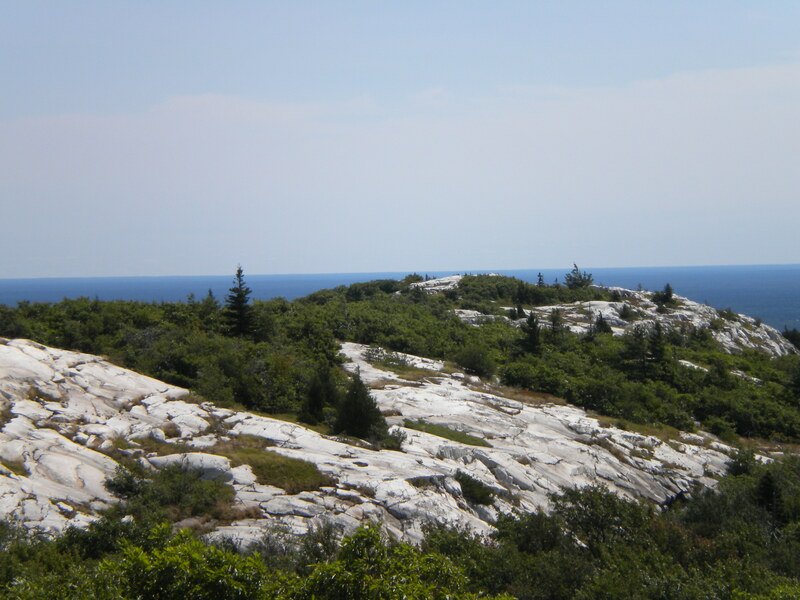 If you want to combine this hiking trip with fishing, the French River is a short drive away as well as Georgian Bay, both known for their incredible fishing opportunities and you can spend some time at Sand Beach Lodge or Pleasant Cove Resort.